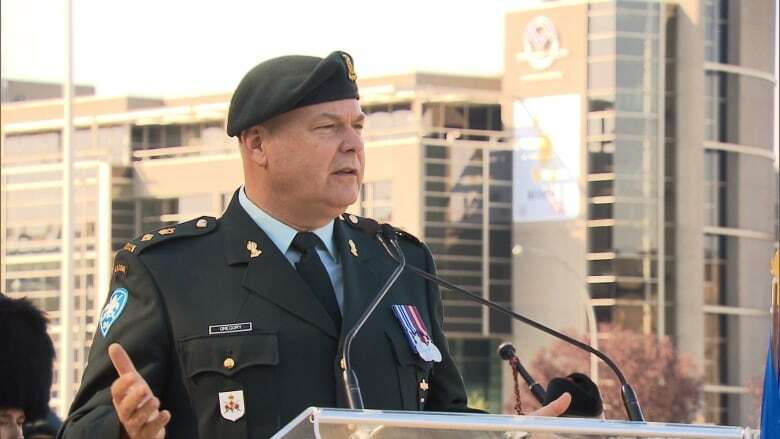 A monument aiming to raise awareness of the mental health issues Canadian soldiers grapple with, including post-traumatic stress disorder, was unveiled in Kirkland over the weekend. 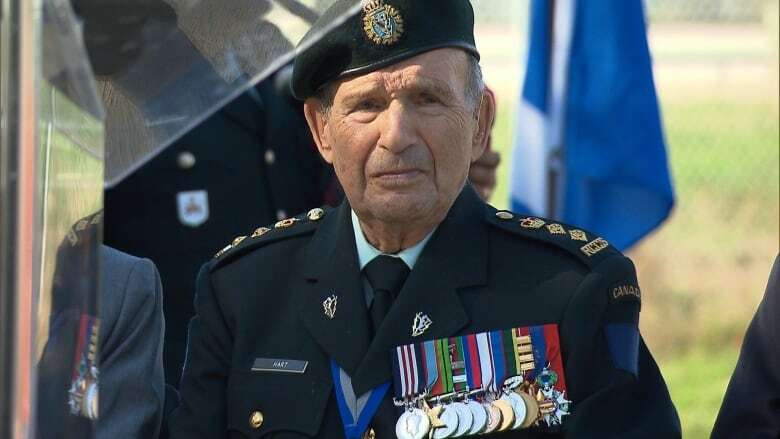 Honorary Colonel David Lloyd Hart fought in one of the deadliest battles in Canadian Forces's history, the Dieppe raid, but the 100-year-old says post-traumatic stress disorder wasn't yet fully understood. 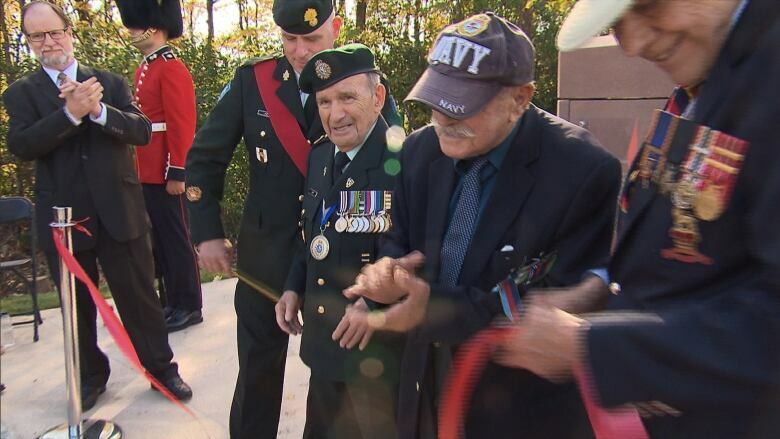 "The sights you see when you're in battle is such that [it] impinges on your mind for the rest of your life," Hart said Saturday at the unveiling of a military monument in Kirkland, on Montreal's West Island. 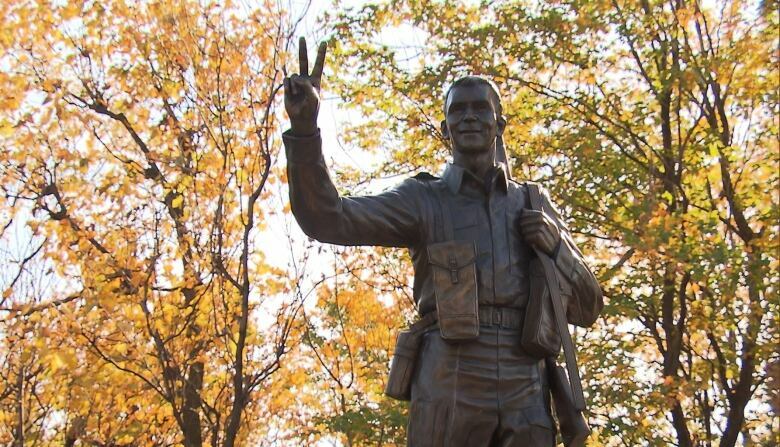 The monument aims to bring awareness to the invisible injuries war often leaves on Canadian soldiers. "I felt very sorry for the guys that I saw that did suffer from it and had no help until recently," Hart said. 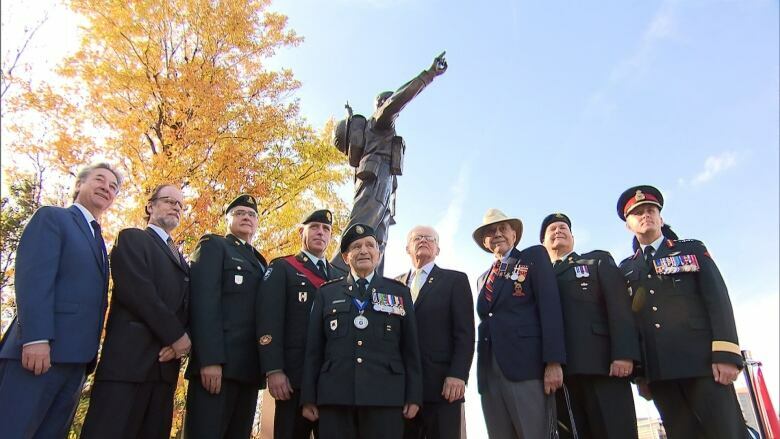 The monument was an initiative of the Respect Campaign, a group working to consolidate efforts to get soldiers and veterans the services they need. "This is the culmination of a lot of work," said Honorary Lieutenant Colonel Steve Gregory, who is a fundraiser with the Respect Campaign. "It's heartwarming. We've got a long way to go, but we're very happy." Another one of the campaign's initiatives, Gregory explained, has been to develop a way for outreach workers to find out if homeless people are veterans and then get them help. By some accounts, there could be as many as 200 veterans living on the streets of Montreal, Gregory said. Dozens of charities are "clamouring to help our veterans," Gregory said, but doing so can be a tricky dance. "They just have to find them and sometimes they don't want to be found," he explained. He said the campaign has come up with a "delicate series of questions … to engage homeless people without judgment." Pierre Côté, a professor at the Collège militaire royal de Saint-Jean and current serving member of the Canadian Armed Forces, who was deployed to Afghanistan three times, says there's still a lot of stigma surrounding PTSD. The next place that stigma needs to be broken down, Côté says, is within each soldier who may have it. Many try to fight PTSD on their own, and feel shame in asking for help. That's where efforts like the Respect Campaign can help, he said. "I see great value in that campaign because it shows our community what we did and what we do when we come back home," said Côté, who was representing currently serving military members at the event. He said it felt "puzzling" to stand amid soldiers of Hart's generation. "I don't feel that I am worthy of all that honour," Côté said, "but I think it's something that's common to a lot of us. In our generation, we've been raised in an army with Veterans' Day with a lot older veterans than we are." They were the soldiers he and his peer group looked up to. Côté said he's realizing that "we are now those veterans."